I enjoyed this set with my son as a baby. He understood a lot of the signs, though he never started signing them back to us. All in all it was helpful though and I’m sure if we had invested more time into it we would have done even better. My baby LOVES LOVES LOVES the videos. At first I was watching them for myself to learn the signs, she would be in the room too. Then I noticed that she was copying the signs that she was seeing. She would ask for more by signing “more baby signing time please” before she could speak a word. She was 8 months old when she signed her first sign. By 12 months she knew 20 signs. By 13 months, she could go through all the flash cards and saying most of the words. She is now 2 years old and speaks full sentences and uses her signs when I do not understand what she’s trying to tell me verbally. I strongly believe ASL is a great way to fast track their communication skills. When my 18month old son was not developing speech normally I bought this set to help. Teaching him signs has really helped reduce his frustration and it makes life easier for all of us since he can communicate his basic needs. All of the products were really helpful but we use the flash cards the most. Now he is almost three and has been diagnosed with childhood apraxia of speech and he has had weekly speech therapy weekly for the past year. I really can not imagine our life if we had not gotten him started doing signs. I would recommend this as a tool for anyone whose child has delayed language development! I bought this shortly after my daughter was born. That was 2+ years ago. I started learning as many signs as I could and used them when ever they came up in daily activites. My husband has also enjoyed learning and signing. My daughter started signing for “milk, please” at 9 months, very suddenly and hasn’t stopped. Some had worried that signing would delay speech development, but my daughter started speaking just after a year. 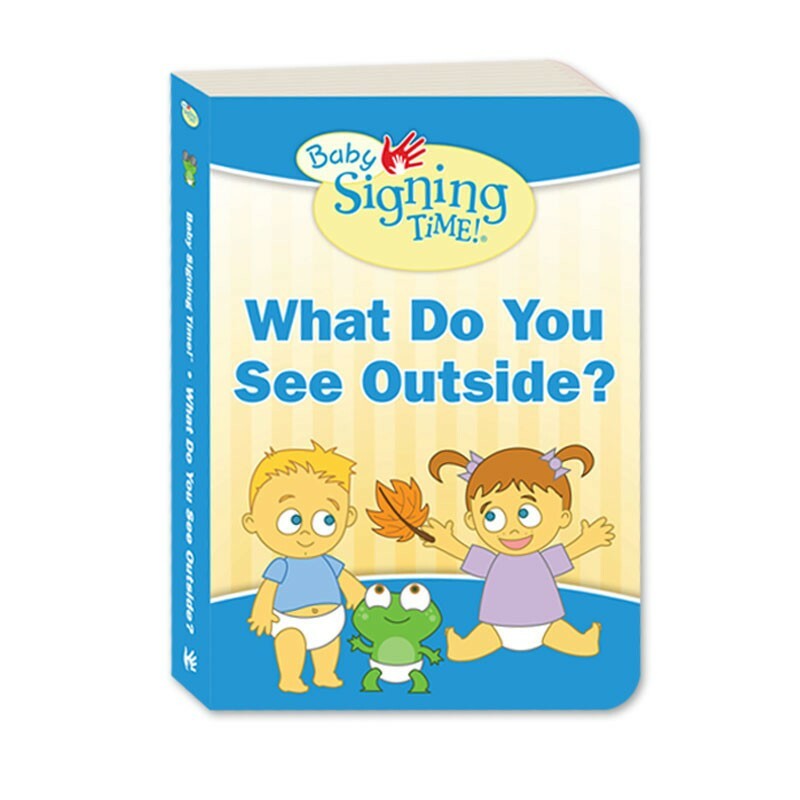 She will sign when she is frustrated and can’t get the words out because she is crying or when she can’t remember the verbal word. We are still introducing more signs as we learn more. She has thoroughly loved looking thoroughly the cards and the dictionary. This has been a great product and we really have enjoyed it! My granddaughter enjoys the flash cards. At 16 she has never spoken. She loves to have me speak the name of each picture and then she tries to sign. She has quite a few of them down. We keep working at it. Our Grandaughter, Lainey,19 months old, loves “Baby Signing Time”. She gets so excited at dinner time when her mom puts it on and she is mezmerized. They flew to Disneyworld and she watched it on the plane, it kept her spell bound. Lainey can communicate without talking. It is wonderful. No frustration in trying to figure out what she wants, for example she signs: more, done, apple juice, water. She is even teaching MomMom and PopPop how to sign. It is an incredible tape.It is very well done. The colors are vibrant the expressions on the teacher and the other children are lively and captivating. Every baby should learn how to sign. It makes her the happiest baby on the block. We started sign with our son when he was a few weeks old. Purchased the starter kit when he was about 18 months. I wish we wouldve started sooner it was amazing! He fell in love with everything and would ask for more videos or to watch again. He picked up on the signs rather fast and it was a great way for us to all learn together since this was the only asl experience we have. he is now 2 and speaks but still signs and asks to watch his videos. I love that it gave him a way to express his emotions and us know exactly what he needs. I heard about terrible twos but with Alek being able to communicate I have not dealt with anything. 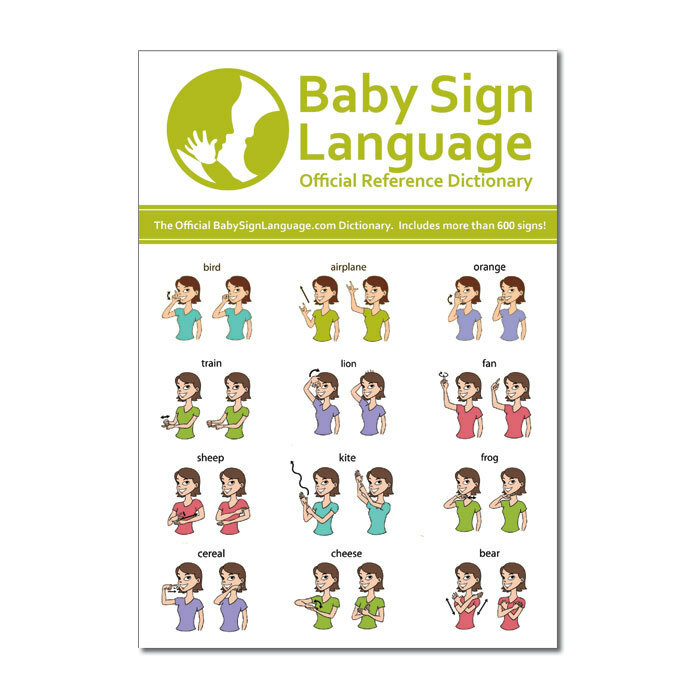 I find this Baby Sign Language a very good product, it helps to develop babys and kids skills and not just that they are learning sign language but it helps them to learn in a different way, even I as a parent am learning in a fun way. 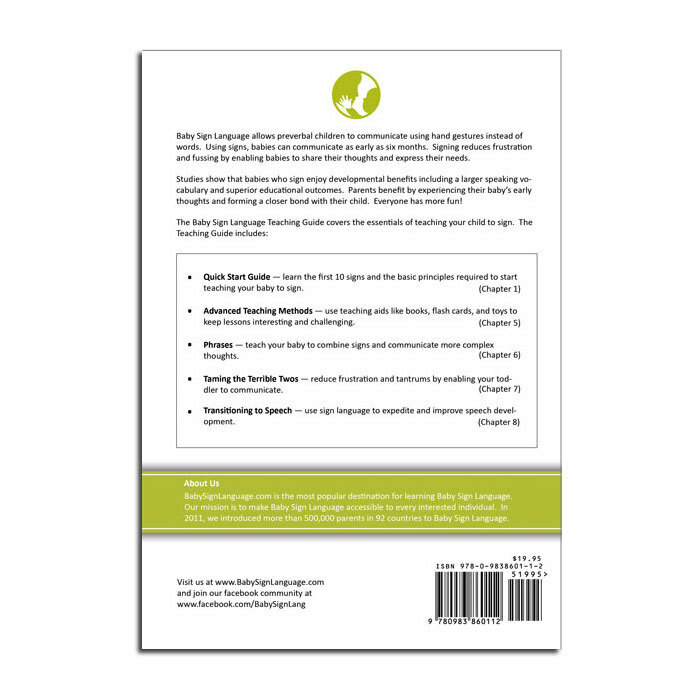 I really appreciated the teaching guide, lots of useful information in there that definitely helped my approach to encouraging my baby girl to sign. I started using signs with her at 4 months. It was slow going the first cpl.months but I kept with it. She is now almost a year and she can sign 14 signs and is picking new ones up faster than I could have ever imagined. She loves the signing time dvds and uses her signs to let us know when.she wants to watch them. This.is and excellent.kit for a reasonable price. My 18 month old loves the baby signing time videos. She has been watching them for only 3-4 months and knows the majority of the words. She may not be able to sign all of them yet but understands when they are signed to her. I am looking forward to introducing more signing time including the alphabet and colors to her in the near future. I purchased this kit with my newborn grandson in mind, however his Mother was not interested in utilizing it. During that year, my other daughter had a newborn girl and she was very interested in the kit. Every my daughter played the videos and she and her husband used the signs as they interacted with my granddaughter. My granddaughter LOVED this kit and from early on would sign her requests. As the first year went by, she began speaking and signing. She would verbally request “Baby” (the videos) and sign “baby signing time”. The videos are interactive, fun, musical and greatly assist the child’s early learning skills. My granddaughter will be two this week and I find her vocabulary, her comprehension of everyday events and her memory are, in my opinion, way ahead of her age group and her three year old cousin! I believe this product to be helpful and fun for children and adults alike. One of the best purchases one can make to benefit child development. We loved this kit. My daughter is 11 months and carries the card all over the place. She loves signing and knows so many words. It has really helped our communication. I really love the website and I use the dictionary all the time. I wish I would have bought the cd and books with it. Whenever I can, recommend Baby sign language, because the results of the method not only surprised us when my second child learnt to communicate at her early life, but I think, it taught us the habit of teaching to communicate, which turn to be very helpful. I think that the method has several strengths, it proposes early stimulation on children, it is based on simple principles that parents can follow easily, its continuity and engagement builds strong links between the parents and the child, it may be a great help for multilingual children, and it is simply rewarding when your child signs back at a very young age! Great pictures and explanations. I am a speech therapist and find the material useful and basic enough to share with parents. I refer parents to your website too. Love it! Definitely would recommend it! These were a great tool to use. My son really enjoyed the movies! We’ve used them since he was about 8 months old. He didn’t really pick it up like I had hoped, but at 2 now, he suddenly is using signs! It’s so neat to see and be able to better understand him! I would recommend this kit to anyone wanting to try out sign language. It’s really the best price for all these tools. And you never know what tool your baby/ child will pick up on the most. Great product! 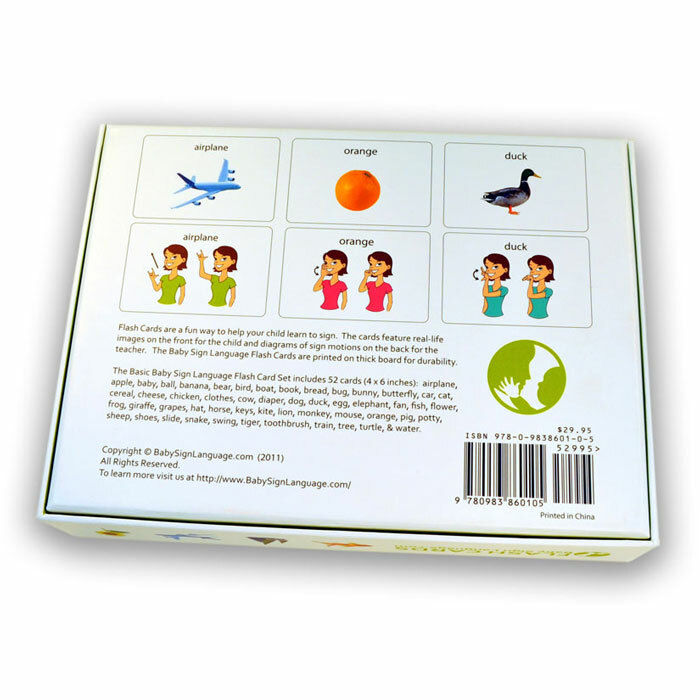 This product has really helped my 2 year old to communicate with me as her speech develops, less whining! We used this to teach my daughter sign language. The book and flash cards were very helpful. I also really liked the online dictionary with the video demonstration of the sign-my mind just worked better to see it visually done. I highly recommend teaching sign language. It was easy to teach, my daughter picked it up easily and continues to add new signs for more difficult words she cannot say at almost two years old. 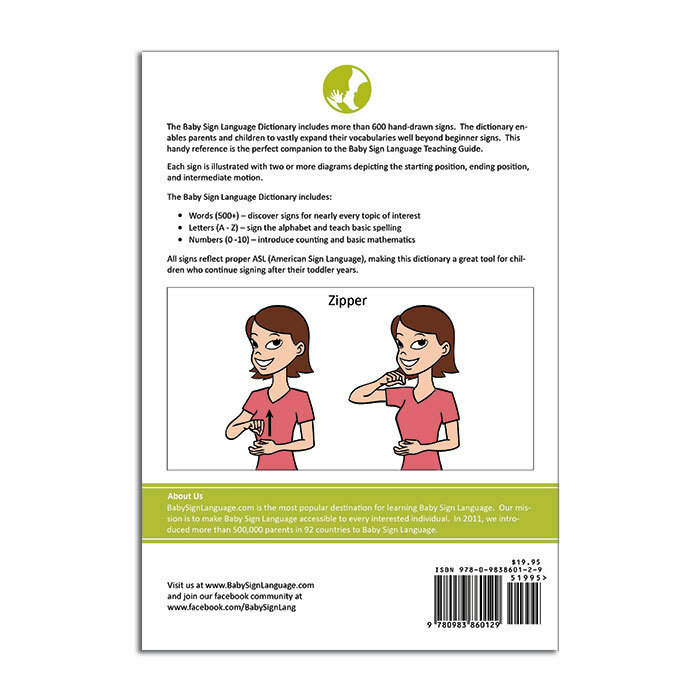 Baby Sign Language includes clear and easy to understand illustrations of signs. We focused on 15-20 signs that related to our daily lives and found that it helped our baby/toddler communicate with us. Signs can reduce frustration for baby and parent during those pre-verbal months when a child knows what they want but can’t say it yet. We also found signs to be useful for our toddler during quiet times like church, when talking would be disruptive, but he still wanted to ask questions. Our children learned signs from parents using them during regular speech. We did not utilize flash cards, or have a designated time to teach signs. Overall a positive experience and a quality product. I learned about Baby Sign Language from my sister. We got the kit and started signing when Matt was 7 months old and he got it after just a few weeks. Now he can do mommy, daddy, eat, and more. It is so much fun and so useful. He just smiles and smiles when he does a sign and we understand him. We have just started using the flash cards, and he doesn’t know any of those signs yet, but he loves playing with them. The DVDs are a big hit. He loves to watch them, and it gives me a spare moment to catch up on chores. My only regret is that he only watches one of the DVDs so I probably could have gotten the cheaper kit, oh well maybe he will watch the others when he is older. This was the BEST purchase we made for our son. He loves to sign. Even my husband who was sceptical loves it now. I started sign language with my son when he just 1 months old. I don’t know where I got the idea from to introduce sign language. I’m sure it was in the middle of the night in between feedings when you can’t go to sleep and you start to love your phone because it’s with you and ready to engage more than your sleeping spouse. Oh, I digressed. I introduced the basic signs to him: milk, mommy, daddy, more and please. The discs were introduced by 2 months (child development specialists cringe as much as you want to, it’s my child) and they were the only things that’s ever really kept his attention. Even at 16 months, he is still excited about Baby Signing Time. I wished I used the flash cards and poster that came with the entire package more but I don’t sweat that. I am using them now. At 16 months he’s fully aware of things based on the videos this I do recognize compared to other kids his age. For his birthday we had a segment where the kids did Old McDonald Had A Farm and it was a big hit. People have asked what we use because he signs a lot now and I’m always tweeting his milestones. I say consistent practice WITH your baby is going to be key. I’m a doctoral student and I work full-time. At the end of the day, I just want to relax but he’s learning is important. Now, I’m on to Spanish Immersion. You won’t go wrong with this product. I hope you find this review helpful. It really works! I started it when he was only a couple of months old just to have it in his environment and I think it helped him catch on early and quickly. We even continued to use the flash cards for the photos alone when he started talking. This kit was worth every penny and I am so glad we decided to take the sign language route for a form of early communication. He started day care when he was 18 months and they also used baby sign language–yet another reason I am glad we had a head start. The video assistance provided by the BSL website was very helpful. 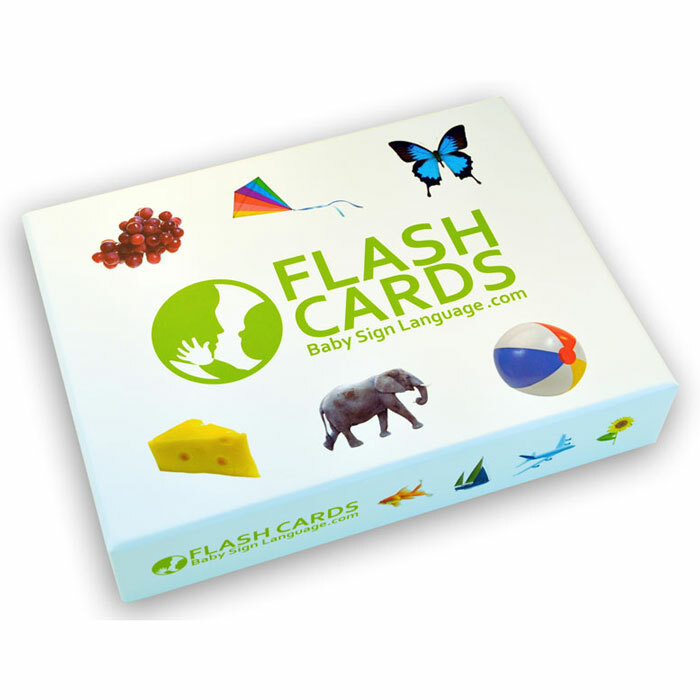 I recommend this product/kit to anyone considering teaching BSL. It also makes a great gift! I LOVE the product! 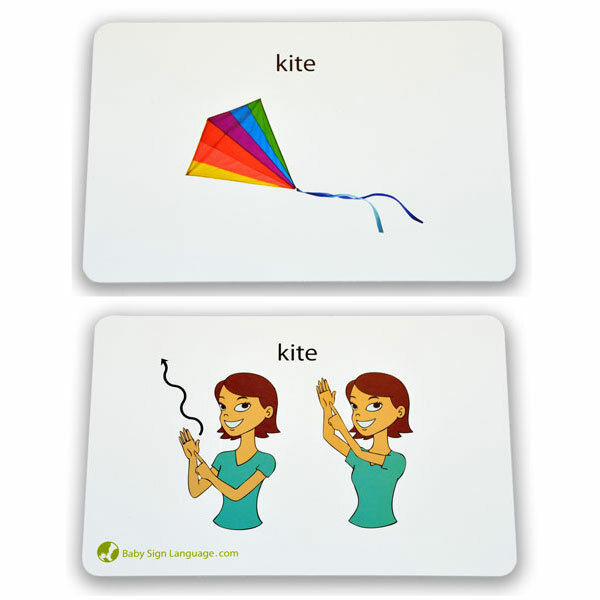 We find the flash cards are also really helpful for the spoken word as well as we are a bilingual household! Our only regret is that we gave up too soon. We thought our son was not interested and stopped around the one year mark. Then at 16mths to our astonishment, in a very fussy moment, we realised he was signing that he was hungry and wanted to eat!!! We have not looked back since! So stick with it!!! A great help in avoiding melt downs!!! Not to mention a beautiful language for us all to learn! I gave this product the highest of ratings because from start to finish, my impression of the product and this company was fantastic! My questions were answered by Baby Sign Language staff with enthusiasm and genuine passion for spreading the benefits of using sign language for any family. The products arrived quickly (even being shipped to Canada) and the quality of the products and user friendly teaching method exceeded my expectations. This is a rare combination of excellence in consumer products. Congratulations Baby Sign Language! This review was for a previous version of this product. From everything I’ve seen, I am pretty sure that our daughter is much less prone to tantrums and way more observant about the world, since she has language to describe what she’s seeing. She’s starting to combine signs in sentence-like combos now. Other non-signing kids are barely able to speak enough words to say that they’re hungry. She’s also speaking more words than the other kids too. She speaks while signing now. It helps us interpret the baby-talk. All in all, I’d do it again in a heartbeat. Love, love, love! My daughter is not quite one year old and already knows over a dozen signs, and I cannot imagine life without baby sign language. She is so chatty! When we walk down the street she points out trees, birds, and dogs, and she can easily tell us when she wants milk, food, crackers, cheese, or a diaper change. Seriously, I don’t know how people parent a pre-verbal child who does not know baby sign language! The kit was really the most helpful learning tool we had. My daughter loves playing with the flashcards, looking at all the pictures, and naming the signs she knows. I really do recommend the Deluxe kit whole heartedly!! I like the kit. We use the flashcards and the dictionary is nice to have. I’m volunteering on translating it to Norwegian if that’s a possibility. I read a book on baby sign language and was working with my 8 month old daughter for nearly two months but she wasn’t getting it. I was so disappointed and frustrated. I came to this site and asked a few questions. I got a very quick response and decided to order the kit. My goal was to teach my daughter just the critical signs to help her communicate with me. I read the book, changed my approach slightly and my daughter started signing! I was so excited – it worked!! One day she started playing with the flash cards so I showed her a few signs. A week later, I said one of the words and she gave me the sign for it! I was shocked! At 14 months, she knows at least 30 signs and loves signing. She points to planes and birds in her story books and does the sign. I use the dictionary often to look up words and my daughter loves playing with the flash cards. The Deluxe Kit is the way to go! I love that when my daughter gets fussy in the car I can ask her what is wrong and she signs a response. 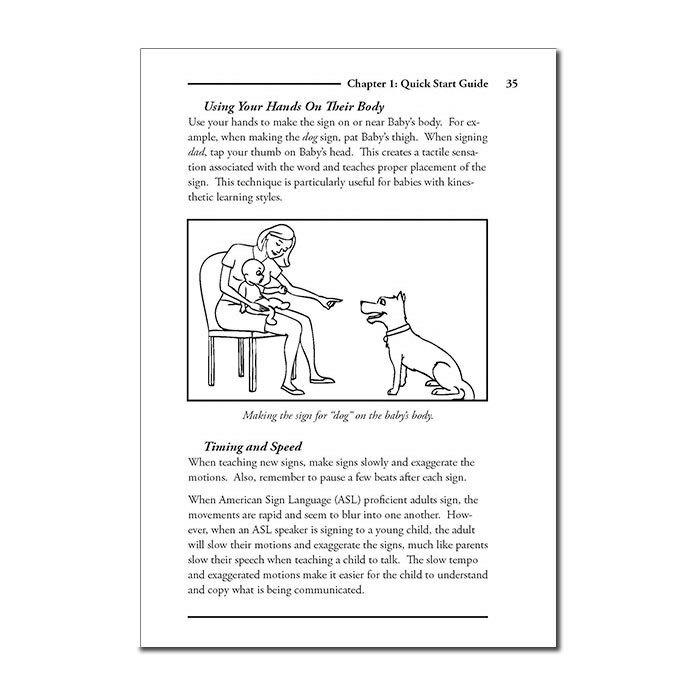 I purchased BSL for my (at the time) 7 month old baby. I was so determined because I have heard some babies learn at 6 months. He is now 14 month and still only uses the sign “milk” which is fine. I sign to him as much words as I know in hopes of him copying me, but he really does not. BUT, he understands what I am signing. I can honestly say, I probably did not do a program as consistently as I could have, so that could be why. Or I am not doing it right. I feel all children learn at their own pace, and I feel he is just not ready yet. The fact that he uses the sign milk, has seriously been so beneficial. I breastfeed still, so regardless, I know that is what he wants. I feel that the products that I relieved > the poster, sturdy flashcards, and dictionary, are such wonderful resources, and I feel that I made a great purchase. Also, the website shows live people signing words that you may not understand from the pictures. I feel baby sign language is wonderful for all children, and I love learning to sign as well. 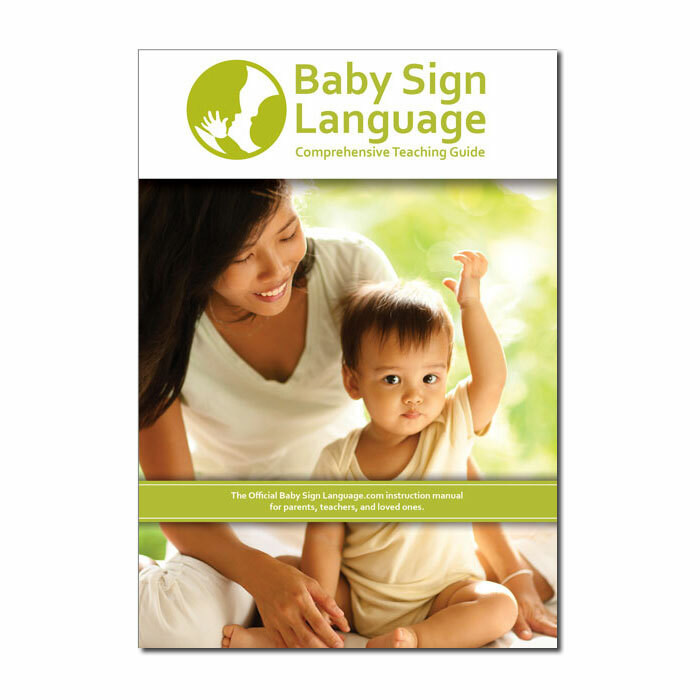 The only thing I can suggest, is to include a learning booklet that is a teaching guide to better understand how to use a baby sign language program. That is where I feel was the hardest, is not knowing exactly what to do. I can sign words, but have no idea how to converse or make a sentence. We ordered the delux baby sign language kit for our 9 month old after realizing he knew more words in sign language from his daycare class than we did! I was pleasantly surprised at the quality of flash cards. They looked great but withstood the torture of my son as he got older. Even as he’s learning to speak they are a great flash card to help teach him words. We’re looking forward to being able to use the kit with our youngest son very shortly. Great kit for a great price! My child loves the flashcards. A couple signs were missing, such as sleep, bath, but overall awesome! Thank you for your review and feedback. You can find free printables of sleep and bath in our digital collection. Baby Signing Time! Book 3: What Do You See Outside?